With the motto “Food With Integrity,” Chipotle Mexican Grill’s brand is based on ethical fast food. Hundreds of workers in nine lawsuits in six states allege the company’s moral high-ground on pork, beef and chicken doesn’t extend to its cooks, cashiers and managers. The lawsuits share common allegations: Denver-based Chipotle cheated employees out of pay by making them work off the clock or misclassifying them to avoid paying overtime. One in Colorado alleges hourly employees were automatically clocked out even though they were still working. The largest lawsuit underway alleges managers-in-training known as “apprentices” are actually glorified burrito rollers with minimal managerial responsibilities and should be entitled to overtime pay. The cases are part of a national trend – over a decade long – where workers increasingly turn to federal courts to recoup wages they allege their employers have illegally withheld. Coloradans are among 643 plaintiffs, as of April, suing Chipotle for allegedly unfair labor practices. Brittany Swa is one of them. She worked at Centennial-area Chipotle stores for almost three years, moving up from crew member to apprentice and finally to general manager. The staffing software calculated how many employees to schedule every day to be profitable given the store’s sales, she said, with her bonus on the line if she didn’t hit the right numbers. Former Chipotle worker Brittany Swa has joined a lawsuit against the restaurant chain seeking unpaid overtime. “The goal is to obviously have a little less people so you’re making a little bit more profit in your store,” Swa said. Swa and other Chipotle apprentices allege they mostly worked the same tasks as hourly workers did: grilling chicken, mixing guacamole, rolling burritos and ringing up orders. According to Chipotle’s website, apprentices make almost twice as much as kitchen and service managers, who are paid hourly. Apprentices are classified as exempt employees and not entitled to overtime pay. They worked up to 60 hours a week, but were not paid for time over 40 hours as a matter of corporate policy, the lawsuits argue. Unlike other fast food restaurants, Chipotle stores are not independent franchises. Swa paid a personal cost for the long hours, she said. She constantly left her infant son with her mom and missed his first steps, first words and even his first solid food. “I was always getting texts and pictures from my mom, like, ‘Look what he did!’” Swa said. Tight labor budgets don’t extend to the Chipotle company’s executives. Shareholders voted to approve executive compensation at their annual meeting on May 13 this year, a reversal of last year’s no vote.The company’s two chief executive officers, Steve Ells and Monty Moran received over $57 million in total compensation last year, including company car costs of $45,913 for Ells and $32,220 for Moran, according to the company’s corporate filings with the Securities and Exchange Commission. In comparison, Coca-Cola’s one CEO received $25 million, Wal-Mart’s received $19 million and McDonald’s received $7 million in total compensation last year, according to SEC filings. The CEO of Jack in the Box, which owns Qdoba, received $5.5 million last year. Average total compensation for a Chipotle crew member, the most entry-level position, is $21,071 a year including meals and clothing, according to the company’s website. An hourly kitchen or service manager can expect to earn $27,650 a year. Corporate filings show the company spent about as much on housing for chief financial officer Jack Hartung ($36,499) and chief creative and development officer Mark Crumpacker ($38,696), as it did on annual salaries for each apprentice employee without counting benefits ($38,247). Last year Crumpacker received $5 million and Hartung received $10 million in total compensation, including $33,710 in “commuting expenses” to pay airfare, parking and ground transportation to travel between Chipotle’s Denver headquarters and Hartung’s home. Separate cases filed in Colorado and Minnesota allege the computer timekeeping system automatically clocked workers out after 40 hours, even though they had to clean the store or attend mandatory meetings. They allege managers received bonuses based on keeping labor costs low. Chipotle denied the allegations in court and said the company complies with labor law. Additionally, the company argues it pays for off-duty meals and breaks, which is above what the law requires. Chipotle has sought to have the Colorado lawsuit dismissed as a duplicative case. Yet, inspectors have found illegal practices similar to plaintiffs’ allegations at stores across the country, U.S. Department of Labor investigation records obtained by I-News show. In 2012, the computer at a Cincinnati, Ohio store automatically clocked out a worker, even though she was still cleaning the store. But because she was owed was less than $20, investigators found, her claim was dismissed. The Department of Labor ordered three Chipotle stores outside Portland, Ore. to repay 24 workers an average of $706 in unpaid wages in 2012, because employees worked off the clock after closing the restaurants for the night. “Additionally, there appeared to be a culture of off-the-clock work as the situation extended beyond a single manager and to more than one store in the area,” an investigator wrote in a Tualatin, Ore. Chipotle investigation. The Department of Labor levied $5,280 in civil penalties for pay violations at a Happy Valley, Ore. Chipotle store. “The managers were under a tremendous amount of pressure to meet labor goals,” an investigator found. None of Chipotle’s 74 Colorado stores have ever been investigated by the federal Department of Labor, according to an I-News analysis of federal data. As of last year, Chipotle had about 53,090 employees and 1,783 restaurants in the U.S. and abroad. “There are a lot of these lawsuits that are brought are ‘gotcha’ lawsuits that are technical violations,” — Richard Alfred, employers attorney. Nationwide, since 2006 federal labor authorities have investigated 24 Chipotle locations and recovered a total of $19,440 in unpaid wages for 36 employees, government data show. Loose government enforcement is one reason private attorneys are heralding cases of unpaid wages, said labor law enforcement expert, Catherine Ruckelshaus of the National Employment Law Project. “The private bar stepped in to take up that slack,” Ruckelshaus said. Employers in other industries are facing an increase in employee lawsuits. Nationally, lawsuits for unpaid wages have increased 137 percent since 2004, from 3,426 to 8,126 in 2014, according to federal judicial caseload statistics. The trend extends to Colorado, too. The federal district court here saw 96 lawsuits filed under the Fair Labor Standards Act in 2014, up from 22 cases in 2004, according to filings listed on federal courts’ Public Access to Court Electronic Records or PACER database. Richard Alfred of law firm Seyfarth Shaw, which defends such cases, calls the trend an “epidemic” but doesn’t agree it’s caused by lax enforcement. The Fair Labor Standards Act, which governs minimum wage and overtime payment, is now 77 years-old and hasn’t kept up with the current economy, he said. That mismatch creates litigation opportunities for plaintiffs, who are better informed of their rights than before, and lawyers looking for more clients, he said. 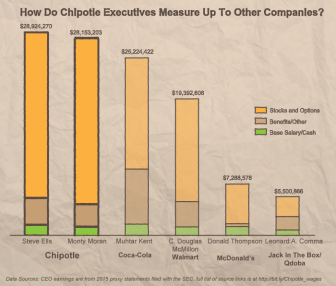 How do Chipotle’s CEOs’ pay measure up to other companies chief executives’? “There are a lot of these lawsuits that are brought are ‘gotcha’ lawsuits that are technical violations,” Alfred said. In Colorado, once workers have filed lawsuits in federal court, they have almost always been able to resolve their complaints without going to trial, according to an I-News analysis of lawsuits filed and terminated in the past three years. Those records show that 32 percent of case dockets mentioned settlement had been reached and 48 percent were dismissed by a plaintiff alone or jointly with the defendant, an indication that the parties may have resolved the dispute out of court. The court ruled in favor of the worker’s employer in only three percent of cases and in favor of workers in only three percent, the I-News analysis found. Workers can recoup attorney’s fees as part of a settlement, but in the Colorado cases each party was often responsible for their own costs, which can reach thousands of dollars. In April, a Maryland Chipotle worker settled her case for alleged “wage theft” and received $5,727 in back wages and damages, including attorney’s fees. Chipotle denied all allegations. Workers in Florida and California reached confidential settlements in three lawsuits against Chipotle for unfair labor practices. Former Chipotle employee Swa liked working at Chipotle, but thinks the company should treat its store employees better by increasing time for employee training and promoting work-life balance. “Definitely an area of opportunity for them would be integrity with their employees,” Swa said.